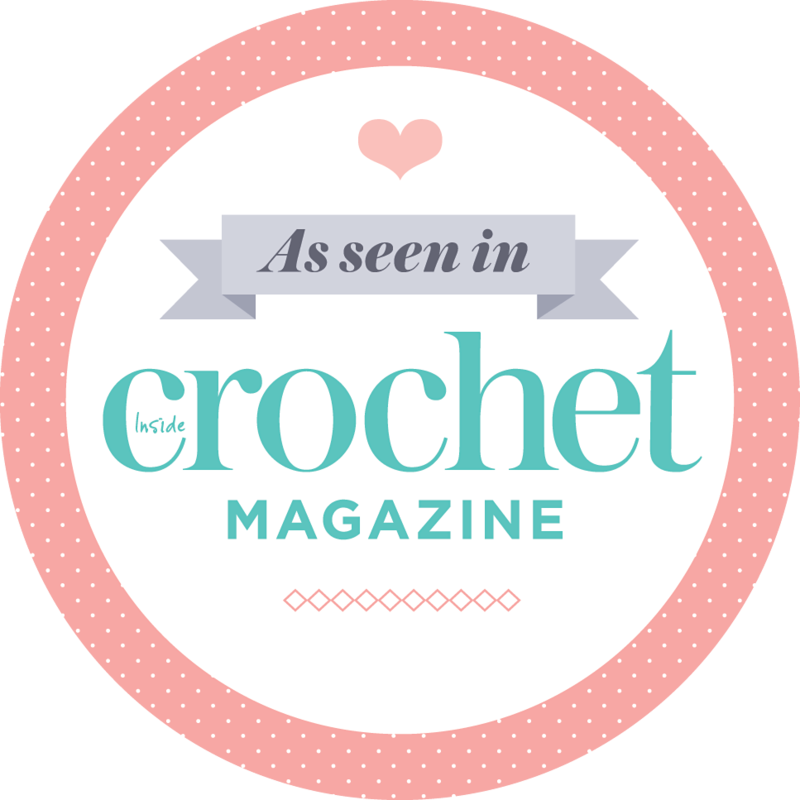 Posted by Natasja in Book reviews, My crochet, My ramblings, Ta-daah! The lovely people of Mollie Makes magazine sent me the book How To Crochet, published by Pavilion, to review here on my blog. I have to apologise to the publishers that it has taken me this long to do the review, but I wanted to do the review justice by completing one of the 20 projects featured in the book. 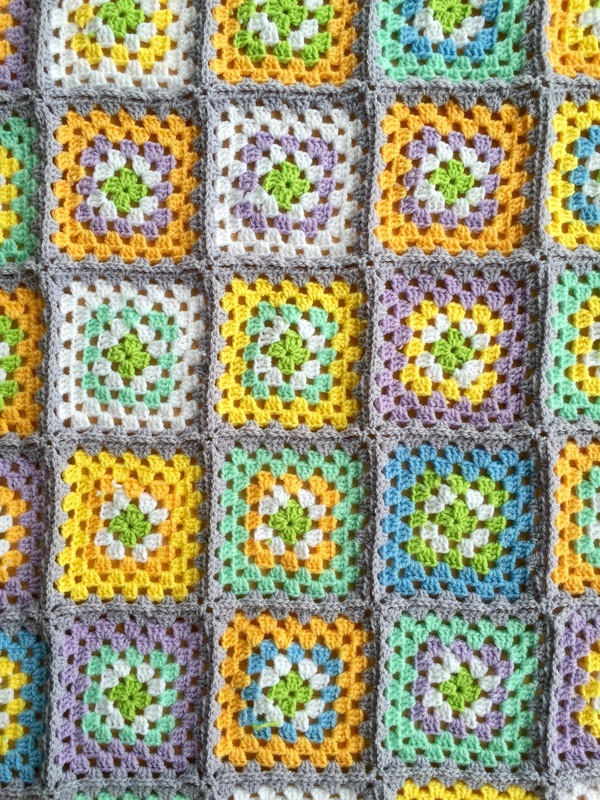 I chose to make the Granny Square Blanket With Edging, designed by Anita Mundt. You guys know how I love granny squares! They are my all time favourite thing to crochet. For Crochet For Kidneys Part 4 I made two 2-colour 6-round squares in blue and in pink, and in 2013 I crocheted a traditional granny square blanket for a friend and even posted on my technique for choosing random colours. I really enjoyed following the colour scheme suggestion in Anita’s pattern. I know how to make a granny square so I didn’t need the pattern for that, but I found that following the designer’s colour scheme took away all the worry that I may get my colours wrong. In this pattern the colour combinations are partly fixed and party random. Rounds 1, 2 and 6 are fixed colours, round 3 is random and 4 & 5 are also random but you use the same colour for both rounds. Once I had decided on the colour for rounds 1 (green), 2 (white) and 6 (Parma Violet), there wasn’t much ‘randomising’ left to do. Choosing my colours for each square was really quick and I think I will stick to this partly fixed, partly random, colour scheme for all my future granny square blankets! The colours I used were: Stylecraft Special DK in White, Saffron, Wisteria, Spring Green, Citron, Cloud Blue, Parma Violet (for the last round of each square) and the bright green was James C Brett Supreme Baby DK in SNG7. I really love that Parma Violet shade. It’s not grey, it’s not purple, it’s just a beatiful tie-it-all-together shade. Please excuse the wonky photo but it’s difficult to get a blanket to lie flat and take a perfectly straight taken-from-above photo when you have only one leg to balance on! For this blanket I also didn’t have to go looking for border like I do with my other granny square blankets – Anita’s border was just so perfect – I just had to follow her pattern. The team from Mollie Makes (the UK’s most successful lifestyle and craft magazine) hand-picked the projects for this book. All the patterns were designed exclusively for this book by the team’s favourite crochet designers: Ilaria Chiaratti, Emma Lamb, Beata Basik, Cara Medus, Pip Lincolne and Anita Mundt. Apart form the Granny Square Blanket With Edging which I made, there are more fun and beautiful projects like the adorable set of Russian dolls from the cover photo, Bouquet of Flowers, pocket placemats and Monster Gadget Covers called Chomper, Nibbles and Tryclops. How To Crochet contains all the techniques you need to get started with crochet, with step-by-step instructions and clear, beautiful illustrations. 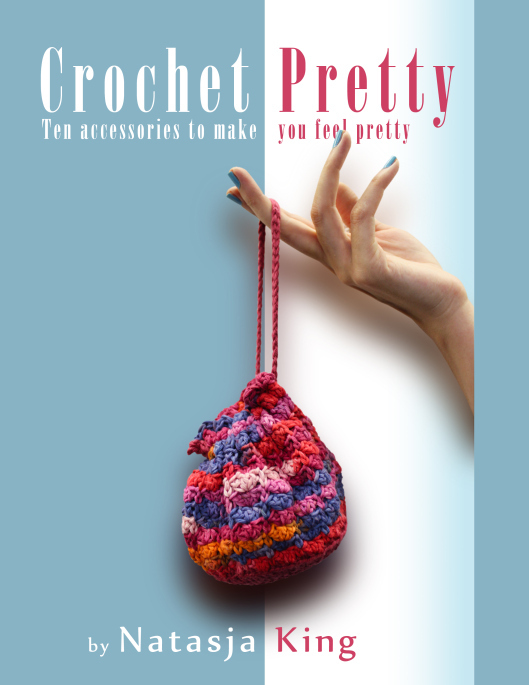 Each of the 20 patterns have a Crochet Story which I really enjoyed reading – even if I weren’t going to make the project. 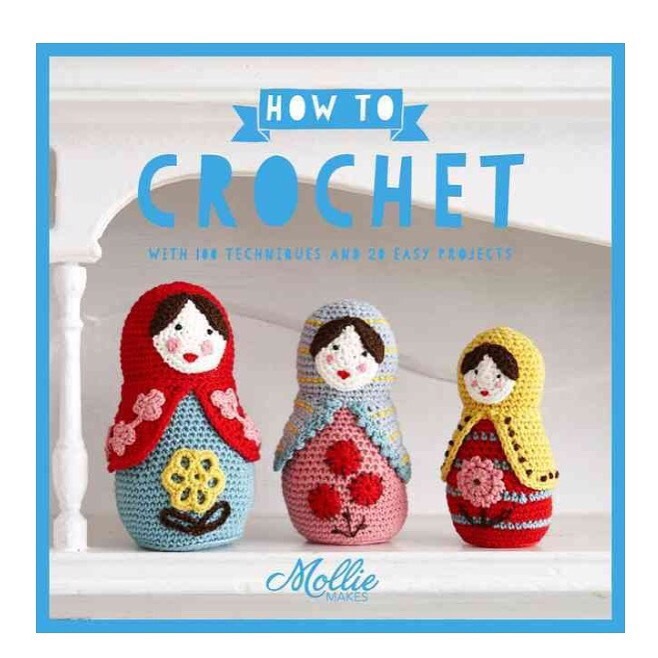 How To Crochet is available on Amazon for £9.99. If however you don’t want to purchase one, why not enter my giveaway! 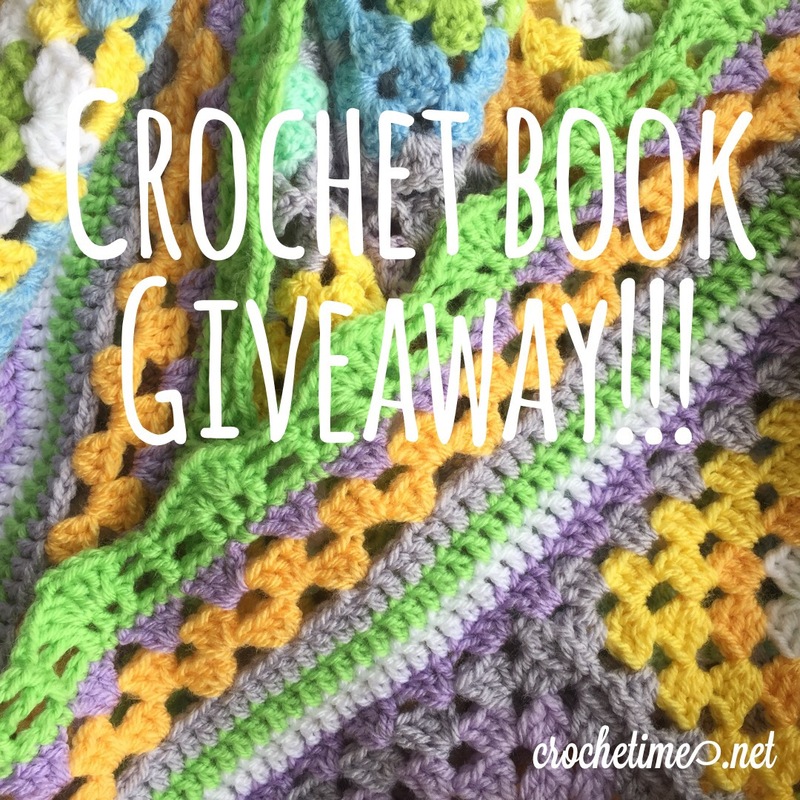 I’m giving away two copies of How To Crochet by Mollie Makes. All you have to do is leave a comment on this blogpost telling me what your favourite time of day and/or week is to crochet. There’s no special reason why I ask this question, I’m just interested to know when my readers sit down with their yarn and hooky stick. The winners will be drawn randomly and announced on my Instagram feed (natasjaking) and crochetime Facebook page on 7 August. Good luck! I usually crochet in the evening while I am watching TV. It is something that I enjoy doing and can still keep track of what is happening in the show I am watching. Oh my, I crochet morning, noon and night! I love to crochet anytime, especially when out and about. That is a beautiful blanket! I too crochet anytime, anywhere, but my favourite time is probably on a cold dark winter evening after all the chores are done and I can just relax and forget about everything else. Congratulations you won a copy of How To Crochet! Whoo-hoo!!! Please use the Contact Me for to send me your address. I like to crochet any time of day. At night time it soothes away the troubles of the day and lulls me into a trance like peace. Crocheting at any time or any day of the week works for me! But I tend to have more creative energy on Saturdays. That Granny Square blanket is beautiful… great work! I crochet any time of the day but the moment I specially love is after lunch (siesta in Spain), these lazy hours too hot to go out. Excuse me for my English, and regards from Spain. MariCarmen. I crochet mostly in the evenings when watching tv. Sometimes when everyone has gone to bed and I feel this is my me time. Love the blanket and the Russian dolls. 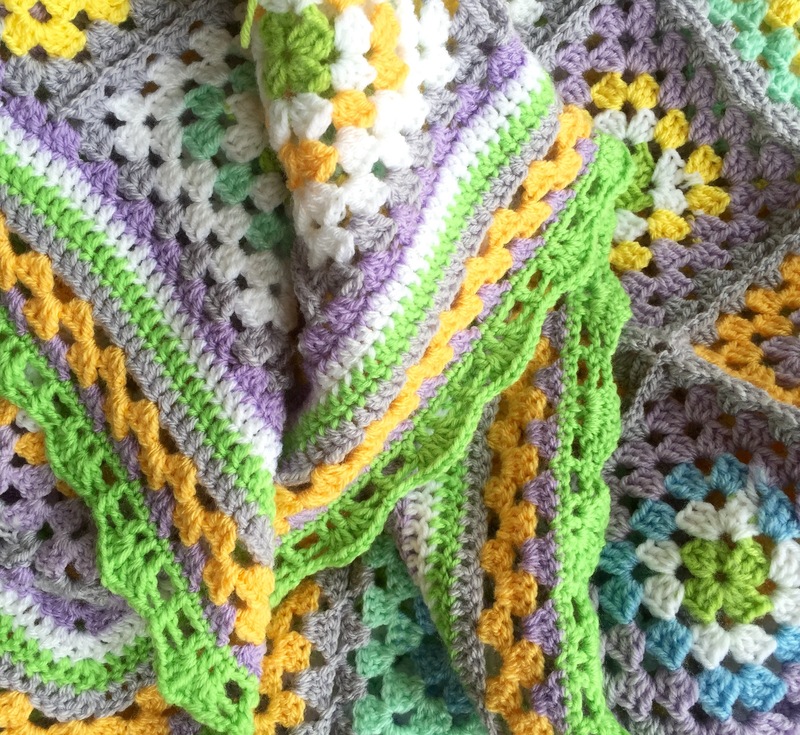 Excellent review, makes me want to also make a granny blanket with vibrant colours. Hope you speedily recovering from your operations. Please enter my name into the giveaway as well. I love to crochet at anytime. I am handicapped and stay at home so I can, but my favourite time to crochet is when I am in bed late into the night, a Netflix series on the TV and snacks…..
My favorite time is evening if I watch TV. Currently I’m on vacation in Germany and Austria and crocheting on the train and a bit before I go to bed. My inspiration for my blanket is your blog!! Congratulations you won a copy of How To Crochet! Whoo-hoo!!! Please use the Contact Me form to send me your address. I usually crochet 10 a.m. for a bit. Sunday anytime is good for me as it is a relaxing day.